This is my 30th installment of Babywearing Stories 365. Each installment features a babywearer in 1 photograph and their answers to 5 questions. My goal is to normalize, promote and celebrate daily Babywearing, moving beyond *what* we use to carry our babies and shifting focus back on *why* and *where* we carry. 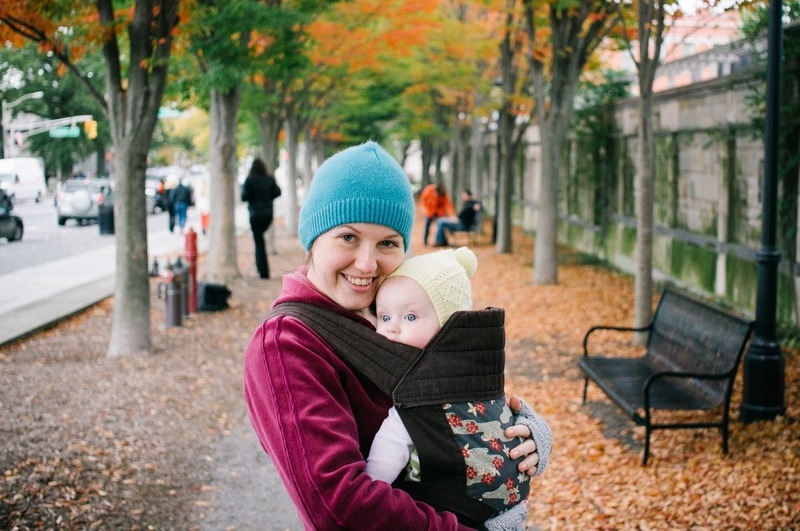 I hope to share the stories of moms, dads, and babywearing caregivers all over the world. Enjoy! This is me, Megan, with my daughter, Sophie, when she was about 9 months old (she’s 13 months now). My husband, Paul, was behind the camera. On the first crisp, cool day of autumn last year, we decided to go for a walk around Princeton, NJ and take in the brilliantly colored foliage. This photo was taken on Nassau Street, just outside the main entrance to Princeton University. In general, we both tend to like wearing more than the stroller. When she was very little, she was extremely fussy, and wouldn’t tolerate me putting her down for even a minute; it finally occurred to me around 6 weeks to find a babywearing group in my area to get me started, and since then I’ve been wearing her around the house so I can actually get things done. A year has passed and putting Sophie in a carrier when we go somewhere is second nature. She is happier riding on me than in the stroller, and since she is not an otherwise particularly snuggly baby, I cherish wearing her because it is one of the few times when she happily nuzzles close to me.